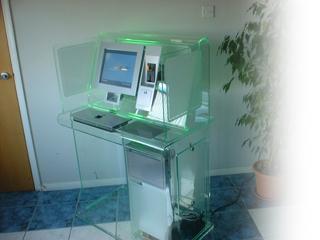 i-Touch V38 Mark II Kiosk Desk Unit with Transparent Glass Panels and 15'' screen - Future Generation Kiosk Products. A new direction in kiosk information access with added privacy / security. The v38 Mark II Workstation Kiosk can be fitted with plain panels, vanity vinyl and privacy screen filters.